The Old City of Istanbul (Turkish: Eski İstanbul, also Tarihi Yarımada and Suriçi, “Historical Peninsula”, and “Walled City” respectively) is the oldest part of Istanbul, and the location of most of its historical sights. Being a peninsula bounded by bodies of water to north, east and south (the Golden Horn, Bosphorus and the Sea of Marmara, respectively) and by the old city walls to west, this part of the city is essentially what used to be called Constantinople, as the rest of what is today Istanbul was part of independent cities, towns, villages, fields or even complete wilderness later absorbed by the city. This process is still going on as Istanbul grows with increasing speed. Istanbul, or Byzantium as it was called then, was first settled by Greek colonists from Megara in Greek mainland in 667 BC. 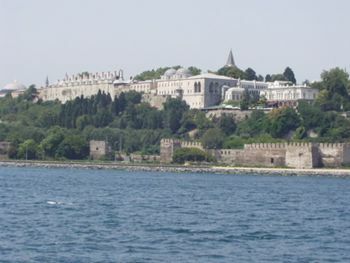 They founded their city at Seraglio Point (Sarayburnu) which is now occupied by Topkapı Palace. However, recent discoveries in a metro construction site in Yenikapı (on the southern coast of the peninsula) dates the very first date of Istanbul's settlement back to about 8000 years ago, which makes the city one of the oldest still-inhabited spots of the world. This peninsula was declared a World Heritage Site by UNESCO in 1985. Sultanahmet, walking distance to the all historical sights of Istanbul named old city. Being one of the most central parts of the city, getting to the Old City by public transport is easy. The waterfront often hosts cruise ships, providing passengers (not on tours) with easy, self-arranged access to sights and shopping. A modern tram line lies all along the old city, connecting it with Galata and other places north, and the suburbs in the west. Tram stations are located at Eminönü, Sirkeci, Gülhane, Sultanahmet, Beyazıt, and Aksaray among others. With the cancellation of public bus line T4 between Taksim and Sultanahmet, easiest way to get to the old city from Taksim by public transport now is to take the funicular from inside the metro station at Taksim Square and then transfer on to tram at Kabataş station. You have to buy two tokens at the metro station (3TL each). If you travel with 2 or more then a taxi may be cheaper. A metro/light rail line connects Atatürk International Airport and the main bus station (otogar) outside the city with Aksaray. From Aksaray, you can take the tram (follow the ‘tramvay’ signs) for places deeper into the Old City (such as Sultanahmet). If you are approaching from the airport, you can also change from metro to tram in Zeytinburnu. Changing at Zeytinburnu is better than changing at Aksaray, as the metro and tram stations in Zeytinburnu are much nearer to each other (making it highly unlikely to get lost!) and it’s the first station along the line, which means you can easily secure a seat after your long flight. The metro comes every 15 min and the journey from the airport to Sultanahmet (including changing trams at Zeytinburnu) takes around 45minutes. The metro is clean and climate-controlled. Cheaper and, especially if arriving or departing during Istanbul's rush-hour, much faster than any other transportation option. 96T the bus from Atatürk Airport to Taksim also passes through some parts of old city. The stop nearest to Sultanahmet is Aksaray/Valide Sultan. From there, you can take the tram. You can get on any bus which goes to Eminönü or Beyazıt since both places are very close to Sultanahmet, if you would like to go there. You can either walk (about 10-15 minutes) or take a tram from both places. However, there might be traffic at certain times. Sultanahmet also makes your tavel easier to catch bus to other touristic destination you can check how it will be possible here. Liners from Kadıköy and Üsküdar across the Bosphorus moor at Eminönü. There are also smaller private boats plying on the same routes. Another option is to take the boat from Üsküdar to Kabataş and take the tram. If you are arriving in Istanbul by one of fast ferries from towns across on the southern and southeastern coast of Marmara, your likely point of entry to the city is Yenikapı on the southern shore of the peninsula. Trains from Europe and European Turkey have their terminii at Sirkeci station, which is located in this district. It's also possible to take the suburban trains (banliyö treni), which have about 30-min intervals and cost 1.50 TL pp, from Bakırköy and other coastal suburbs in the west to Sirkeci. In istanbul there are lot of yellow taxis, and fares are not expensive. From Ataturk Airport (IST) to Sultanahmet is about ~20 km. and the fare is ~60.00 TRY. Also from Sabiha Gokcen Airport (SAW) to Sultanahmet is about ~46,2 km. and cab fare is ~170.00 TRY. Uber is also available throughout Istanbul. The tram line connects almost all of the sights frequented by travellers. Most of the sights in the old city are close enough to be negotiated on foot, as they are located in or around Sultanahmet Square. For many others, just follow the tram line. However, between Eminönü/Sirkeci and Sultanahmet, it is faster to to take the shortcut through Ankara Caddesi (Street) and stray away from the tramline as the tramline follows an arch through that part of the city. The sidewalk along Hüdavendigar Caddesi between Sirkeci, Gülhane, and Sultanahmet Square is not very wide and trams pass along fairly close to the sidewalk, so watch your steps especially when you hear tram's horn. 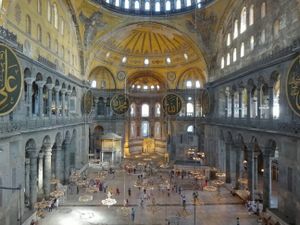 The Museum Pass İstanbul  is a good way to visit Chora Museum (30 TL), Hagia Sophia Museum (40 TL), Topkapı Palace Museum (40 TL) and Harem Apartments (25 TL), Hagia Irene (20 TL), İstanbul Archaeological Museums (20 TL), İstanbul Mosaic Museum (15 TL) and Museum of Turkish and İslamic Arts (20 TL) with one ticket and without having to queue (prices as of October 2016). This ticket costs 85 TL and is valid for 5 consecutive days, there are also discounts for other museums and shops. Available in several hotels or at the entrance to any of the above museums. If you want to save time and not line up to buy the museum pass, you can use the machines dedicated to that at the entrance of some of the above museums (at least Hagia Sofia and Topkapi Palace) but keep in mind that these machines only accept credit card (no cash). 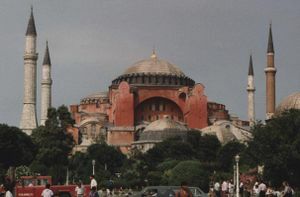 Hagia Sophia (Aya Sofya), Sultanahmet Square (by tram: Sultanahmet), +90 212 522-17-50. Tu-Su 09:00-18:00. 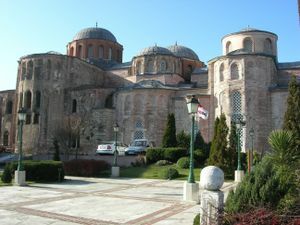 Dating from the sixth century, it was originally a basilica constructed for the Eastern Roman Emperor Justinian I. A masterwork of Roman engineering, the huge 30 m diameter dome covers what was for over 1000 years the largest enclosed space in the world. The church was looted by the fourth Crusaders in 1204, and became a mosque in the 15th century when The Ottomans conquered the city. It was converted into a museum in 1935. Don't miss the excellent mosaics, including those in the gallery, reached by a stone ramp to the left of the entrance. As of April, 2016, the entrance fee is 40 TL (credit cards & Turkish currency accepted), with no student deductions. The Museum Pass is also accepted. You can also hire a guide at the entrance of the museum. Note: as of Dec 2011, the museum consists of a few poster boards of pictures and a little information. As of October 2016, construction work is being carried out. Hagia Sophia is still open, but there is scaffolding (mostly inside) on about one third of the visitable area. 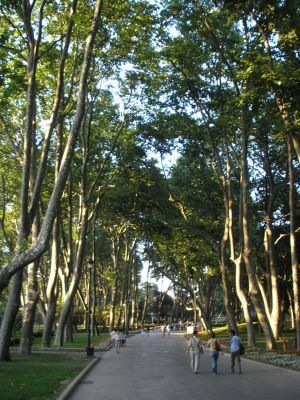 Topkapı Palace (Topkapı Sarayı) , Bab-i Hümayün Caddesi (by tram: Gülhane/Sultanahmet), +90 212 512-04-80. M,W-Su 09:00-17:00. The imperial enclave of the Ottoman emperors for four centuries. Lavishly decorated, with four courts of increasing grandeur. In the second court of the entrance to the Harem (admission extra, only by joining a guided tour) and the State Treasury, housing a weaponry display. The third court has the Imperial Treasury. Both Islamic and Christian relics, rugs, porcelain. The views from the Fourth Court over the Bosphorus are spectacular. You can also see Prophet Mohammed's belongings. As of October 2016, the entrance fee is 40 TL (no concessions, credit cards and Turkish currency accepted. Harem 25 TL extra)or with the Museum Pass. Note: As of October 2016, some of the areas of the palace are closed for restoration (e.g. the Prophet Mohammed's belongings). BEWARE Any bus or tram with a sign or indication that it heads for or calls at Topkapı will NOT take you anywhere near Topkapı Palace. Rather it will to a neighbourhood named after the city gate near which it’s situated (“cannon gate”), which may be worth a trip to take a look at the impressive city walls. Topkapı neighbourhood is located in the extreme western part of the old city, near the city walls, while Topkapı Palace is located in the extreme eastern part, which means the distance between each other is at least 7-8km. ‘Topkapı’ alone almost always refer to the neighbourhood, not the palace. Taking a bus heading for Topkapı to go to the palace is a common mistake made by visitors. For the palace, the stop/station you should look for is 'Sultanahmet'. Sultanahmet Mosque (Sultanahmet Camii, aka Blue Mosque) , At Meydan Sokak 17, Sultanahmet (by tram: Sultanahmet), +90 212 518-13-19. May-Oct 09:00-21:00, Nov-Apr: 09:00-21:00. With its six minarets and sweeping architecture the Sultanahmet or 'Blue' Mosque impresses from the outside. Unlike Haghia Sophia, this is still a working mosque, entry is through the courtyard on the SW side which is back side of mosque. No shorts or bare shoulders (shawls are provided) and you will need to remove your footwear (bags are provided that you can place your shoes in). Entrance is free, but donations are welcome upon exit. The mosque is closed during ritual prayer but mosque volunteers provide you with a free presentation about the Mosque and also about Islam during that period. The venue for this event is the Mosque's conference hall. It is the building with "Free Event" sign that will be on your left while you are approaching the Mosque from Hagia Sophia. There is no entrance fee, and there is even free refreshments. Women need to wear head scarves, which can be bought in nearby shops for 5-15TL or borrowed at the mosque for free. Everyone needs to cover their legs (no shorts or short skirts). 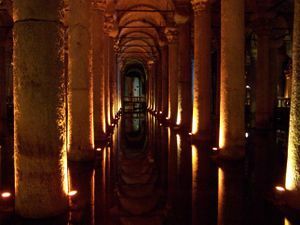 Basilica Cistern (Yerebatan Sarnici). Yerebatan Cad., Sultanahmet , 09:00-18:30. A giant underground cistern built by Justinian in 532 to provide water to the city in cases of siege. A wooden walkway winds between the pillars, and lights and piped music add to the eerie atmosphere. Bring some type of fish food as you'll see enormous fish swimming below your feet, and throw a coin into the pool to make a wish. The statues of Medussa are impressive. 3 TL for Turkish citizens, 20 TL ( October 2016 -no concessions. Turkish currency, NO credit cards accepted, NO Museum Pass accepted.). Hippodrome, adjacent to the Basilica Cistern, Blue Mosque and Hagia Sophia. This was the centre of Roman and Byzantine Constantinople, and is a great place to begin one's tour and to watch people. The building no longer stands, but the obelisks and sculptures that have been collected here since Theodosius' time in the fourth century remain. The four bronze horses in the facade of St. Marco in Venice used to be on top of the Emperor's box in the Hippodrome and they were looted by the crusaders in 1204. While you are on your way to the hippodrome, don’t forget the German Fountain (Alman Çeşmesi), a neo-Byzantine style fountain building at the square leading to Hippodrome. It was a gift sent by German Kaiser Wilhelm II to the Ottoman Sultan. Süleymaniye Mosque (Süleymaniye Camii; about 15-20 min walk away from Beyazıt tram stop/Grand Bazaar, also same distance away from Eminönü, but you should walk uphill from there). On the top of a hill overlooking Golden Horn is a work of Sinan, an Ottoman architect of the 16th century. The mosque is a fine example of Ottoman architecture of the era, and inspired the architects of the Blue Mosque (Sultanahmet) which was built later. Comparing these two mosques, Süleymaniye is noted for its gloomier and more atmospheric feeling. Next to the courtyard of the mosque are tombs of Sinan himself, Sultan Suleiman the Magnicifent, and his Ukrainian spouse, Roxelana (known as Hürrem Sultan in Turkish). Free admission (both the mosque building itself and tombs in the courtyard). As of June 2010, the mosque is under construction with very little of the interior available to see. Currently, best seen from a distance. Walk Along the Golden Horn Poke around forgotten corners just over this hauntingly beautiful inlet from the Bosphorus. You make some thrilling - and chilling - "finds" on cobbled streets as you trace its narrow alleyways and ancient squares. The Greek Orthodox Patriarchate housing a column which is believed to have been used for the binding and flogging of criminals in Jerusalem is here. The magnificent Neo-Gothic, Neo Baroque -well literally hand made doll house -St.Stephens Church is located on the western shores. 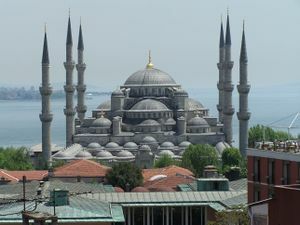 The cascading domes and four slender minarets of the Imperial Suleymaniye Mosque dominating the skyline. One of Istanbul’s surviving mediaeval synagogues...and trendiest houses in town that are now enjoying their second or even third type of use. 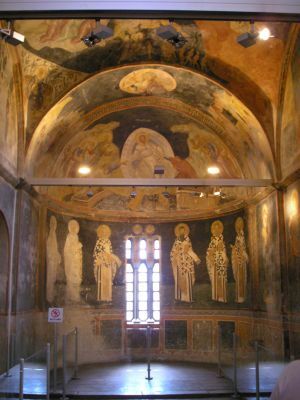 Highlight is the famous Chora the Byzantine marvel of mosaics and frescoes. Most of Istanbul's historical Turkish baths, known as hamam and are quite an inevitable part of any Istanbul experience, are located in Old City around Sultanahmet. Istanbul's historical bazaars are located in Old City. Grand Bazaar (Kapalı Çarşı). . Istanbul's grand old bazaar with an estimated 4400 shops lined along covered walkways. It is said to be the world's oldest shopping mall, covers several blocks and features a labyrinth of side streets to keep you lost for the better part of a day. The shops are organized around their wares, e.g. the silver jewellers are clustered together, the carpet shops are clustered elsewhere and the shoe shops are bunched together somewhere else. Parts of it now are rather touristy (most locals don't shop there) and you're likely to pay a little more for your purchase than elsewhere but with the vast selection you'll find what you're looking for and it's one of Istanbul's character pieces. Polisajci Brothers Antique Show, 37-39 Yaglikcilar Sokak, Ic Cebeci Han, +90 212 5261831. You will find Ottoman and other antique metal ware - copper bowls, jugs, pots and the like - once used in hammams and kitchens. Derviş, 33-35 Keseciler Sokak, +90 212 514 4525 . Turko-Californian spa shop with raw silk and cotton clothing. Chalabi, 6 Sandal Bedesten Sokak, +90 212 5228171. Grand Bazaars’ oldest family-run antiques dealer offers Ottoman silver, furniture and jewellery from old Ottoman families and other oriental treasures. Deli Kızın Yeri, 82 Halıcılar Çarşısı, +90 212 526 1251 . Deli Kızın Yeri (The Crazy Lady's Place) was founded by The Crazy Lady herself, an American who has retired in Turkey, who specializes in creating flat, useful, packable items using traditional Turkish motifs, handicrafts and fabrics. Items produced by local artists suiting the flavor of the shop comprise the rest of their inventory. The selection of items changes constantly, but generally includes items such as placemats, tablecloths, purses, doorstops, plastic bag holders, napkin rings, tea cozies, Turkish-flavoured teddy bears and dolls, luggage tags, aprons, pillows and limited edition clothing. Deli Kızın Yeri Junior, 42 Halıcılar Çarşısı, +90 224 757 4229. The Grand Bazaar's first and only children's store, filled with Turkish inspired toys and games for children of all ages. Egyptian Bazaar (Mısır Çarşısı, also known as Spice Bazaar) in Eminönü is also a covered bazaar, which is a lot smaller than Grand Bazaar, and as its name implies, houses herbalist and spice shops. Mevlana Rug Store, Torun sok. 1, Sultanahmet, +90 212 5171260 (fax:+90 212 5177476) . Mevlana Rug store is the only store which is recommended by The New York Times. Bazaar 55 Rug House, Akbiyik Cad. 55, Sultanahmet, +90 212 6382289 . The carpet shop known to be most trust-worthy. Mehmet Cetinkaya Gallery, Kucuk Ayasofya Caddesi, 7 Tavukhane Sokak, +90 212 5176808 . Glorious museum-quality textiles, a feast for the eyes. Best Carpet Gallery, Binbirdirek Caddesi No. 3/36 , +90 535 722 01 75 . buy online Rugs and Kilims. Chalcedony. A semi-precious gemstone named after the near-by town of Chalcedon. Chalcedony, 2 Ayasofya Caferiye Sokak, +90 212 5276376 . One stop shop for raw rocks, smooth stones and finished jewellery of the pale-blue, semiprecious chalcedony. You can buy tourist-kitsch souveniors all around the city. A magnet with coloured picture of Blue Mosque and Hagia Sofia will cost 2 TL each. Haggling over the price is the norm when shopping. Shopkeepers usually let you offer a price lower than the retail price; the best bet is to start from sixty percent of whatever is being asked by the shopkeepers. They would usually settle at 75 percent of their original demand after some bargain. Once a price agreeable to both is met, then the sale can be finalized. Certain stalls selling tourist-kitsch souveniors near tourist areas (e.g. Aya Sofya, Topkapi Palace) might have staff that are rude/uncouth and make jokes' at tourists' expense during a sale. An example is the tourist-kitsch souvenior shop nearest the exit of Topkapi Palace, where the young sales staff there have been observed on several occasions to be rude and make jokes at the expense of foreign tourists. It is therefore advisable to buy from older traders, as they are more friendly and more respectful of tourists. The best advice about eating in Sultanahmet is: DON'T. Restaurants and Kebab places in Sultanahmet are mainly destined to tourists with prices much higher than in places such as Taksim for instance. Many restaurants also try to charge "service charges" or"covers" or "comissions"- be sure to check the menu for these charges before going in. Avoid restaurants that try to sneak these hidden charges in to their menus. If such charges are not written on the menu, but still appear on your bill, know that this is against the law and do not accept any excuses, even if they try to show you that they pay the government taxes on that service- it is still illegal if they did not write it on the menu NO MATTER WHAT. Do not think that it is only a few lira, or that it doesn't matter- tourists allowing themselves to be scammed has now caused ordinary Turks to suffer as well as more and more restaurants attempt to cheat locals. For budget meals as well, it is advisable to avoid the restaurants along the tram line in the same area, although there are some really nice places there where a lunch can cost TL20 and they offer water-pipes and boardgames. When having a look for a restaurant, there will be a lot of restaurants, where the personel is trying to make one come inside. There is really a kind of competition between the restaurants to make one come inside. However, the best restaurants are not always the expensive tourist restaurants, but those small Lokantas where even the turkish people go for having dinner. Rumeli Cafe a.k.a Mozaik Cafe, Ticarethane Sokak No:8 (near Divanyolu Caddesi, about one block from the Basilica Cistern), 212 512 00 08. On a relatively quiet street but close to all the attractions of Sultanamet. Serves mostly traditional Ottoman and Turkish dishes, with lots of lamb on the menu. Staff are friendly and there are tables both indoors and on the sidewalk. 35-55 YTL per person (main, appetizer + one drink). Green Corner. Nice, lovely little open-air café just down the road from the Basilica Cistern. Eat a gözleme whilst lying down and smoking a Turkish pipe. The Four Seasons Hotel, Tevkifhane Sokak No. 1, Sultanahmet-Eminönü, 90 (212) 638 82 00 . The Four Seasons does a spectacular, but pricey, Sunday brunch featuring a range of Turkish and international dishes (January 2005 price - 70 YTL, 11.30AM-3PM). Asitane , at Edirnekapi. Asitane specializes in traditional Ottoman cuisine, based on meticulously researched recipes used in the royal palaces of the Ottoman empire. The main theme of these recipes are unique blends of meats and fruits. In spite of the traditional nature of the menu, the restaurant decor would not be out of place in London or New York. Pay special attention to the lamb dishes. Akyar Balik, Karakoy Iskelesi, Balikci carsisi, Eminonu Istanbul, 90 212 455 55 62 . Akyar Balik is a turkish traditional fish restaurant where you can enjoy hot and cold mezes, fresh fish and Turkish deserts. 50 USD/per person including wine or raki. Cheers, Akbiyik Caddesi 20, in Sultanahmet, +90 5324096359. Daily, 10AM-2AM. Offers the cheapest beers in town to a crowd of travellers. The restaurants located on the lower level of the Galata Bridge which connects Old City with Galata also double as beerhouses even if you have no intention of having something to eat. Open-air parts of these restaurants beside the bridge railings offer a beautiful view of the mosque domes and towers and the Topkapı Palace dominating the Old City's skyline. Cagaloglu Hamami Café, Prof. K.I. Gurkan Caddesi, Cagaloglu. A café located in a former hammam, dating 1741, where you can listen to live traditional Turkish music. Sark Kahvesi', Yaglikcilar Caddesi 134 (in the Grand Bazaar) . The most famous cafe in the market and a time warp into days gone by, full of traders playing backgammon. Turkish coffee NTL 1.5. Accomodation in the peninsula is mostly around Sultanahmet. 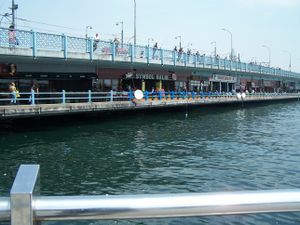 Cankurtaran, a neighbourhood just south of Sultanahmet Square towards the coast of the Sea of Marmara, is one of the places where hotels/hostels cluster most. Istanbul has a large community of CouchSurfing.com users who will allow you to stay at their home free. It is customary to take your host out for a meal, and spend time sharing your culture with them. Hostel Orient, Yeni Akbiyik Cad 13, Sultanahmet, +90 212 517 9493 (fax: +90 212 518 3894, [email protected]), . Okay hostel in a good location in Sultanahmet. Staff are friendly and willing to help. Cafe/bar upstairs, rooftop lounge area overlooking the Golden Horn, Hagia Sophia, Blue Mosque, Topkapi Palace, and the oldest mosque in Istanbul (it's small and has one minaret, just go down the street towards Topkapi). Pretty cheap rooms, but the travel agency downstairs is overpriced, as is the beer in the bar. Belly dancers two or three nights per week in the basement bar, but expect competition for her affections from older local businessmen. 18/20 YTL for 8 bed/4 bed dorm rooms, private rooms 40-70 YTL. 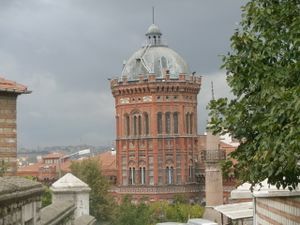 Istanbul Hostel Sinbad, Kucuk Ayasofya Mh., Demirci Resit Sokak, Sultanahmet . Offers budget accommodations for backpackers. They offer discounts for students and hostels' card holders, together with some other amenities as free breakfast. Sinbad has a total 22 rooms - 92 beds. Dorm rooms have six beds, only female dorm, single, double, triple, quad rooms are available. Mavi Guesthouse, Kutlugün Sokak No:3, Sultanahmet, +90 212 517 72 87 (fax: +90 212 516 58 78, [email protected]) . Breakfast is included in the price and this guesthouse is close to the Four Seasons Hotel and many other backpackers. Staff can arrange transport to and from airport (approx 12 YTL). Internet is available for a nominal fee or free with wireless LAN Laptop. Small (cosy) TV room etc. €10/11 for 6 bed/4 bed dorm rooms, private rooms for €20-33. Lamp Hotel Istanbul This lovely budget hotel is stuated at heart of old city istanbul.Some rooms has good view of Sultanahmet mosque which is the symbol of the old city. You can find rooms from 40 euros and the stufs are realy friendly and they make your visiting easly in the town Lamp Hotel Istanbul. Garden House Hotel-Sultanahmet, Kucuk Ayosofya Mahallesi Sehit Mehmet Pasa Sok.Sultanahmet, Istanbul ([email protected] 0212 517 9111). is one of the best lodging options in Istanbul Sultanahmet Old City. Located in a typical and recently remodelled 19th Century Ottoman House building, its peaceful setting in a residential area and proximity minutes by walk to St Sophia Church,Topkapi Palace and Grand Bazaar make it the perfect hotel for both leisure,Honeymoon and family stays. This Boutique and Luxury Hotel has Stunning design, elegant and romantic, each room tastefully decorated and has the very well signs of 19th Century Turkish architecture displaying the immaculate attention to detail reconstructed to provide the ideal blend of color, texture and atmosphere. The hotel get it’s name from the Gardens it has.The Rate Are: €70 & € 250 For Deluxe Room with Balcony. Hotel Prince, Nobethane Caddesi Kargili Sokak 5, Sirkeci, +90 212 513 25 50 [email protected], . The breakfast is served at the roof top restaurant with a great view of Topkapi Palace, Hagia Sophia, and the Bosphorus. Rates start at €75/100 for single/double in high season. Hotel Yasmak Sultan, Ebusuud caddesi no: 14 34110 Sirkeci, +90 212 528 13 43 [email protected] , . Hagia Sophia, Topkapi Palace, Basilica Cistern and the Grand Bazaar are at your doorstep, and the City Center is within walking distance of the Yasmak Hotels which offer an array of comforts and services to render your stay a delightful experience. Yasmak Sultan, one of the oldest hotels in Istanbul, has been home-away-from-home to countless guests since 1965. This hotel offers a boutique ambience and first-class amenities in a 4 star hotel quality. Room rates and prices starts at €75/100 for single/double in high season. Hotel Armagrandi Spina, Utangac Sok. 19, 34400 Sultanahmet, +90 212 638 1727 ([email protected]) . Beautiful renovated boutique hotel that has excellent off-season deals (€60/night via hotels.com) and decent mid-range prices during peak season. Smaller rooms great for couples. Breakfast on terrace included, with amazing view of Blue Mosque and Hagia Sofia. You may see one or both from your room window, too. Elevator, no frills minibar, free wifi, exceptional staff. Armada Hotel, Ahirkapi Sok. 24, 34122 Cankurtaran, Istanbul. Semimodern hotel. Free wireless. Located in Sultanamet between the sea and the Blue Mosque. Working aircon, fridge. Own bathroom. Restaurant at the top of the building with a nice view of the sea and the Blue Mosque. Price via hotels.com: 42 EUR double room. Berkin Hotel, Alemdar Mahallesi, Divan Yolu Caddesi Çatalçeşme Sokak, No: 18 - 20 Sultanahmet Istanbul. 4 star hotel in a very central location in Sultanahmet.10 mins to Blue Mosque by cab. Free wireless is available in the reception area. Clean but small rooms. Double rooms starting at €75/night. Sultanhan Hotel Piyerloti Caddesi No:15/17 Sultanhamet, +90 212 516 32 32 (fax: +90 212 516 59 95, [email protected]), . This five-floor hotel features 40 guestrooms, all of which have Ottoman-style decor with patterned fabrics and chestnut furnishings. All are equipped with internet connections, satellite television and minibars. €190/230 for single/double in high season. Ottoman Hotel Imperial, Caferiye Sokak No:6/1 Sultanhamet, +90 212 513 61 51, . An unbeatable view of Hagia Sophia Museum and Sultanahmet Square and a blend of Ottoman and Istanbul cuisine is what you'll experience at the Ottoman Hotel Imperial. With its exquisitely furnished guest rooms reflecting the Ottoman art, trend-setting restaurants and bars, extensive guest services and in-house amenities, Ottoman Hotel Imperial responds to the needs of the most demanding leisure and business travellers. Rooms start at €100/120 for single/double in high season. Blue House Hotel (Mavi Ev), Dalbasti Sokak No:14, Sultanahmet, +90 212 638 90 10/11/12/13/14/15/16 (fax: +90 212 638 9017, [email protected]) . Opened July 1997 and located at the heart of old city center, steps away from world famous Blue Mosque. €120/140 for single/double in high season. Empress Zoe, Adliye Sokak No:10 (near Akbiyik Caddesi), Sultanahmet, +90 212 518 2504 (fax: +90 212 518 5699, [email protected]) . A wonderful little hotel in a quiet street just off Sultanahmet, with spartan but elegant rooms decorated in Turkish style and beautiful views over the Hagia Sophia from the rooftop terrace. All mod cons including bathroom, air-con, safe. Rooms from €90 and suites from €220, including breakfast. Ibrahim Pasha, Terzihane Sok. No. 5, Adliye Yani, Sultanahmet, +90 212 518 0394 (fax: +90 212 518 4457, [email protected]) . A lovely boutique hotel just steps away from the Blue Mosque and Hagia Sophia. The room rates include a full Turkish breakfast in the dining area off the main lobby. The hotel has a rooftop sitting area with direct views of most of the major sites in Sultanahmet - an incomparable vista as the moon rises on a clear evening. The comfortable rooms have all mod-cons, including wi fi. The staff are attentive, courteous and helpful. Highly recommended. Rooms from €125 for a standard. Dersaadet Hotel, Kapiağasi Sokak No:5, Sultanahmet (one block below Kucukayasofya Caddesi), +90 212 458 07 60 (fax: +90 212 518 49 18 [email protected]) . Boutique hotel on a quiet street 5-10 minute walk from the Blue Mosque and Ayasofya. Rooms are decorated in 19th century Ottoman-style and come with air-con, TV, mini-bar and safe, and all guests can use the high-speed internet/Wi-Fi in the lobby. The rooftop terrace looks out over the Sea of Marmora and part of the Blue Mosque. Room rate includes breakfast. €95/105 for single/double in high season, suites are €120 - 240 depending on time of year and room (10% discount if paid in cash). Hotel Niles Istanbul, Dibekli Cami Sokak No:19, Beyazit, +90 212 517 32 39 (fax: +90 212 516 07 32, [email protected]) . Another Ottoman mansion converted to a hotel, it is located five minutes from the Grand Bazaar. Rooms come with air-con, TV, mini-bar and Wi-Fi, and there is high-speed internet in the lobby. Complimentary breakfast is served in the rooftop terrace, which overlooks the Sea of Marmora. €55/65 for single/double in high season (10% discount if paid in cash). Hotel Inter Istanbul (Budget rates on mid-range facilities), Mithatpasa Cad. Buyuk Haydar Efendi Sok. No: 29 Beyazit, (+90 212) 518 35 35 (Fax: (+90 212) 518 35 38, [email protected]) . Away from the crowd and touts of Sultanahmet yet within walking distance (approx. 7-10 minutes). Located on a quiet street stone-throw away from the Grand Bazaar, Beyazit tram station and buses that goes to Taksim and other parts of Istanbul (2-minute walk). Modern-style rooms, comfy beds, TV with English programs and news, wi fi connection in rooms and a free PC use at the lobby, helpful staff that make-up rooms and replaces towels daily. €35/40 single, €45/50 double, €55-60 triple, €65-80 family (winter/summer) inclusive of breakfast. 10% discount on cash payments and free airport-hotel pick-up (min. 3 days stay). Istanbul Hotel Bulvar Palas (Budget rates), Atatürk Bulvarı, No: 36 Saraçhane,Fatih, İstanbul (+90 212) 528 58 81 , [email protected]) . Rooms with en-suite bathrooms, air-con, satellite TV, and free internet access. From € 50/70/90/100/120 for single/double/triple/quad/family rooms. Erguvan Hotel Istanbul, Aksakal Cad. No:3 Sultanahmet, +90 212 4582784 ([email protected]) . Rooms with air-con, satellite TV. Eski Konak Hotel Istanbul, Cankurtaran Mahallesi Akbiyik Cad. No:44, Sultanahmet, +90 212 458 74 23 ([email protected]) . In the heart of historical Sultanahmet, one of Istanbul's newest hotels. Just a short walk to Hagia Sophia, the Blue Mosque and the Grand Bazaar. Friendly multilingual staff. 9 rooms. Hotel Med Cezir, Tevkifhane Sok. No: 6 Sultanahmet, +90 212 517 59 35 ([email protected]) . Small hotel and restaurant located right beside the Four Seasons Hotel. Comfortable and well appointed guest rooms with or without a private bathroom. Offering exceptional views of the Blue Mosque and Hagia Sophia, the terrace bar is the perfect place for a drink in the evening. 24 hour room service is available. 10 rooms. Hotel Tashkonak, Kucuk Ayasofya Cad. Tomurcuk Sokak 5 Sultanahmet, (+90 212) 518 28 82 (Fax: (+90 212) 638 84 91, [email protected]) . This quaint hotel offers great rooms, an exceptionally friendly staff and some of the best views of the Sea of Marmara anywhere in Sultanahmet. They also have free wi-fi, TV with English channels and a complimentary breakfast buffet every morning. Prices range from €50 for a single room up to €165 for a family room. 8% discount if paying with cash and free airport pickup is available. Hotel Sultan Hill, Tavukhane sok. No:17-19-21 Sultanahmet, +90 212 5183293 ([email protected]) .The hotel has been completely restored to resemble the original 18th century Ottoman house previously on the site. The panoramic view from the terrace is stunning with views of the sea and the Blue Mosque. The hotel is located within walking distance of all the major tourist attractions. There are 17 rooms, a traditional courtyard and a roof terrace bar. All rooms have air-con, mini-bar, TV, wi-fi and a safe. Room rates include breakfast. Room rates: single room 60 EUR, double 80 EUR, triple 120 EUR and family 140 EUR throughout the year. Esans Hotel Old City Istanbul, Ishakpasa Cd. Yenisarachane Sokak No:4, Sultanahmet Old City Istanbul, +90 212 516 19 02 (fax: +90 212 516 19 03 [email protected]) . Traditional Family-Run Unique hotel on a quiet street 3 minutes walk from Ayasofya.Rooms are decorated in 19th century Ottoman-style with air-con, TV, mini-bar and safe, Wi-Fi in the lobby.Complimentary International Phone Call and sellected essence to be placed in room. The rooftop terrace looks out over the Sea of Marmara and Princess Islands. Room rate includes breakfast. €95/110 for single/double in high season, suites are €120 - 190 depending on time of year and room (5% discount if paid in cash and free airport transfer with 4 nights). Hotel Sultania, Ebusuud caddesi Mehmet Murat Sokak No: 4 Sirkeci Sultanahmet, +90 212 528 08 06 (fax: 90 212 511 99 16), . A new hotel opened in 2010 with 42 unique rooms which all the rooms are dedicated to the famous sultan wives. This is a concept hotel offering boutique hotel services and amenities. The room rates starts at 120 € as a discounted opening year rate. Four Seasons Hotel Istanbul at Sultanahmet, Tevkifhane Sokak No:1, Sultanahmet-Eminönü, +90 212 638 82 00 (fax: 90 212 638 82 10), . A converted prison in the historic Sultanahmet district. Offers stunning views of the Haghia Sophia, but no pool. Standard rooms start around $420. Celal Aga Konagi Hotel at Beyazit, Sehzadebasi, Balabanaga Mah. Sehzadebasi Caddesi No:5/7, Sehzadebasi-Eminönü, +90 212 519 09 09 (fax: 90 212 514 09 09), . With a free spa and pool facilities and free wireless internet, Celal Aga Konagi Hotel provides luxurious accommodation in the heart of Istanbul. 5-minute walk away and the Grand Bazaar and Blue Mosque is just a 20-minute walk away. Standard rooms start around $350. All of Sultanahmet Park (between Hagia Sophia and Blue Mosque) is a wifi hotspot free of charge. There are also a couple of internet cafes along the tram line between Sultanahmet and Gülhane. 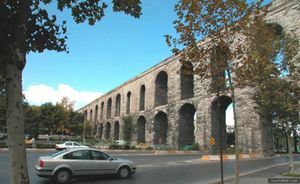 The dilapidated, though picturesque, neighbourhoods around Süleymaniye, Zeyrek, the banks of Golden Horn west of Atatürk Boulevard (i.e., neighbourhoods of Balat, Fener, Ayvansaray), along the old city walls, and along the Marmara coast (especially Kumkapı west to Yedikule) are home to the impoverished recent immigrants to the city. While this doesn't automatically translate to unsafety, you may feel more comfortable if you avoid these places (especially narrow back alleys) during the evening and night. Around the main tourist sights, and the main streets leading to them, in these neighbourhoods, such as Süleymaniye Mosque or the taverns at Kumkapı, are perfectly safe, though. Scams involving extremely overpriced drinks are common at nightclubs around Aksaray, which are best avoided completely. These are quite dangerous with the possible involvement of organized crime. See the "stay safe" section of main Istanbul article for more details on this. Around Aksaray and Laleli, there are a number of illegal brothels which are not controlled by health authorities in any way. If you choose to engage in such activity, keep in mind that the (usually Eastern European and Central Asian) women you will encounter are more often than not involuntarily forced into prostitution to "pay off" the cost of their trip to Istanbul (where they were hoping to get decent jobs) and had their passports seized by their "boss". 24-hr national hotline phone # 157, with operators speaking in English, Russian, and Romanian in addition to Turkish is where you can report such incidents to bring the victims to safety. 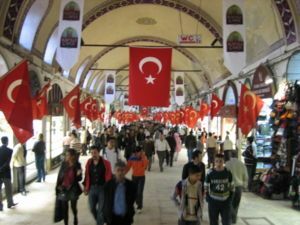 In Eminönü's crowded underground passages (and in the rest of Eminönü, in general), be extremely wary of pickpockets, especially when climbing up and down the stairs. Istanbul Police Department has a "tourism police" office with multilingual staff in Sultanahmet, just across the street from Hagia Sophia, where you can report passport loss or any other problems.